Welcome to the home of London Decca Cartridges. 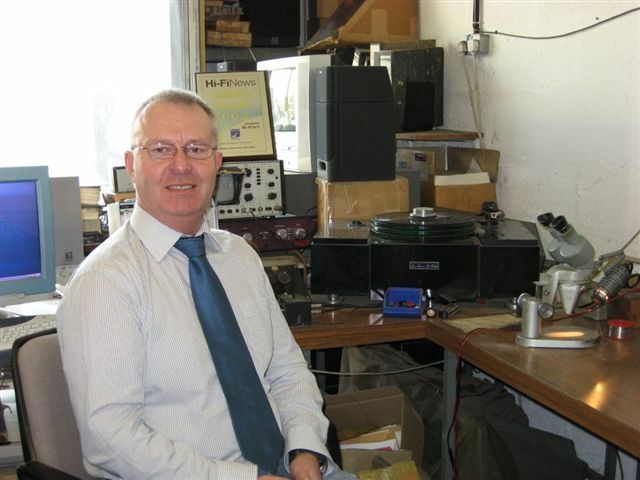 I have been building cartridges under the London brand name and refurbishing all Decca FFSS Heads, Tone arms and Decca London Cartridges for 20 years. Over these years I have designed two new cartridges, the London Jubilee and the London Reference Cartridge, which was awarded 'Best Analogue Component' in the 2004 Hi-Fi News 'Industry Awards'. I have strived to improve the quality and performance of Decca Cartridges, still using the original 'positive scanning' system, which gives the Decca it's unrivaled sound quality and using the latest design in diamond styli. John Wright in his workshop. The original Decca company was started in the 19th century, but it's first involvement with music was with a portable record player used in the trenches during the 1914-18 world war. In the 1939-45 war the government asked Decca to produce a system to identify British submarines from German ones, which resulted in the ffrr (full frequency range recording) system. In 1944 Decca produced the first ffrr music discs. The first LP record (mono) came in 1951 followed by stereo in 1958. Engineers Bayliff and Cowie then designed the Decca ffss (full frequency stereo sound) tonearm and playback head which had Mk I, II and ill versions. Meanwhile, the first item of consumer equipment came in the form of the Decola, a radiogram, with no fewer than five loudspeakers built in. In order that customers could use a Decca head with another manufacturer's tonearm, the company introduced the Mark IV cartridge with elliptical stylus in 1965 and soon after the unipivot International tonearm. To reduce cartridge mass, Decca in 1974 then designed the London Blue and its specially selected export version the Grey (both with spherical stylus). Two years later came the improved Maroon (spherical) and Gold (elliptical). All these had a new mounting bracket for 1/2inch centre mounting holes. 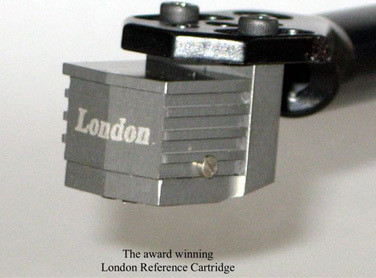 A lighter tonearm, the London International was also introduced. Decca was also the first to produce a carbon fibre record-cleaning brush in 1976. This was further developed into the dual-fibre 2+2 which is still available. The next development came in 1985 with the Super Gold, featuring a modified body shape and a Van Den Hul I shaped stylus. A VDH.0 was also offered as an option. In 1989 Decca's owners, Racal, decided to close Decca Radio & TV and its Special Products (hi-fi) division. They granted a licence to continue manufacturing the products under the London brand name (the Decca name was sold to Tatung) to Decca engineer John Wright and worldwide distribution and repair co-ordination to Brian Smith of Presence Audio. This license is still current. In 1990 London cartridges offered the Martin Bastin-designed Decapod aluminium mounting plate as a factory-fitted option. It can also be factory retro-fitted. The first John Wright-designed new model was the Jubilee in 1992 with a two-piece aluminium body and extended line-contact stylus. In 1995 the Super Gold was fitted with the Jubilee's extended line contact stylus. The next model came in 2004 with a revised two-piece body, designed with help from Conrad Mas of Avid turntables, and having an ultra low mass fine line stylus. Any of the current range may be ordered with a stylus to suit 78rpm or Mono LP playback. What next? At the historical rate of development expect a new London sometime next decade! Meanwhile John Wright is working on something that will be of interest to DJs.